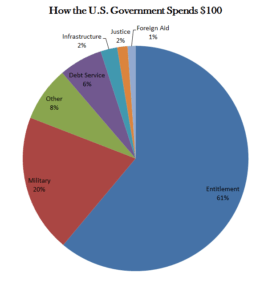 If we categorize spending more generally as entitlements (Social Security, Medicare, Medicaid, Refundable Credits, Federal Civilian Retirement, Education, Food Stamps, SSI, Housing Assistance, and ACA subsidies) what we find is that this portion of federal spending exceeds 61% of total U.S. Government cash outlays. Military spending, at 20%, is a distant second to entitlement spending. While it receives a lot of attention, foreign aid is dead last at 1%. Sanders also notes that entitlement spending has risen dramatically since 2011, with Social Security, Medicare and Medicaid rising 15% as Baby Boomers age and the ACA qualifies more people for Medicaid than had previously been eligible. During the same period, defense spending dropped 22%. As for Federal revenue, payroll taxes, which ostensibly fund Social Security and Medicare, were 34% of the total while spending for those entitlements was 39%, a 5% shortfall, which is likely to increase in coming years. We so often hear that the government doesn’t do enough to support its citizens. In fact, it is income earners who are supporting non-earners or low income earners at a hefty rate. The largest share of federal revenue is personal income taxes, which make up 47% of total revenue. Combined with payroll taxes, 81% of all Federal revenue comes from working individuals. So, Happy Tax Day–not to be confused with Tax Freedom Day, the day after which the average American’s earnings are finally his own. That day doesn’t come until April 24 this year. This entry was posted in realtor, robertjrussell, Social Media and tagged education, spending, taxes. Bookmark the permalink.